Researchers say they have discovered the conditions that determine whether deep soil acts as a source of carbon emissions, releasing heat-trapping greenhouse gases into the atmosphere, or as a sink, sequestering the carbon and keeping it from contributing to global climate change. It’s estimated that as much as 2,400 gigatons of carbon is stored in soil and that two-thirds of that carbon lies at a depth greater than 20 centimeters — meaning that there is enough deep soil carbon in the world to double the amount of carbon dioxide currently in Earth’s atmosphere. Soil organic carbon results from the decomposition of plant matter and can stay locked up in soil for thousands of years. But if below-ground decomposition rates increase due to climate change, the carbon stored in deep soil could be released into the atmosphere as carbon dioxide. According to Caitlin Hicks Pries, an assistant professor of biology at Dartmouth College in the United States and the lead author of a study to be published in next month’s issue of the journal Soil Biology and Biochemistry, understanding how deep soil carbon will behave in a warmer world is of vital importance to projecting future impacts of global warming. Soil organic carbon results from the decomposition of plant matter and can stay locked up in soil for thousands of years. But if below-ground decomposition rates increase due to impacts of climate change, the carbon stored in deep soil could be released into the atmosphere as carbon dioxide. Lead researcher Caitlin Hicks Pries works at the study site. Photo Credit: J. Bryan Curtis. 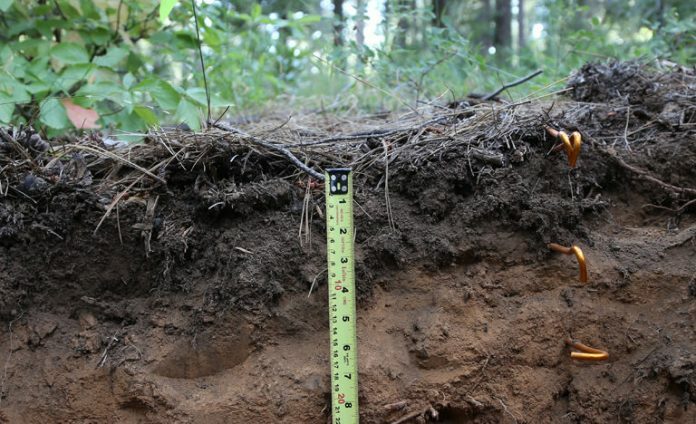 In order to examine the decomposition rates of root litter at different distances below-ground, Hicks Pries and team incubated roots at depths between 15 and 95 centimeters in the soil of an experimental site in an 80-year-old stand of conifer trees located in the foothills of California’s Sierra Nevada mountains. 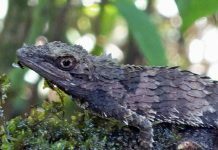 The researchers found that the loss of root litter carbon was roughly the same at all depths for the first six months, but that after 30 months carbon loss slowed significantly deeper below the ground. To arrive at this finding, the researchers relied on the Carbon Organisms Rhizosphere and Protection in the Soil Environment (CORPSE) model, which was developed by scientists at Princeton University and the University of California, Merced. “CORPSE allows us to focus on the role of living things in the decomposition process when studying soil carbon, rather than just looking at the material that’s being decomposed,” Benjamin Sulman of the University of California, Merced and a study co-author said in a statement. The CORPSE model allowed the researchers to determine that decomposition occurs more rapidly when food energy is available to microbes, and that microbes deeper down lose the ability to decompose roots precisely because they have no external source of energy. 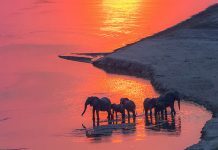 “This study shows why it’s important to include those biological processes in the computer models we use to make predictions about how ecosystems and climate will change in the future,” Sulman added. 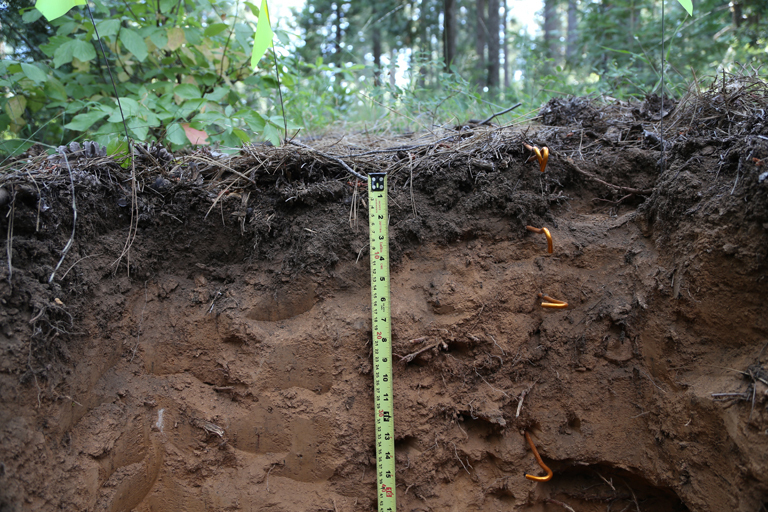 The researchers found that moisture level, temperature, and microbe abundance did not directly impact decomposition rates within deep soil, and that lower nitrogen levels could play a role, though they said further testing would be needed to test that assumption. And while the findings cannot be used to predict how much carbon will be released from deep soil in any particular timeframe, they do show how a change in climatic conditions could affect deep soil carbon. Increased rainfall could cause more dissolved organic carbon to penetrate deeper into the soil, for instance, providing the energy microbes need for energy and leading to more carbon being released into the atmosphere. 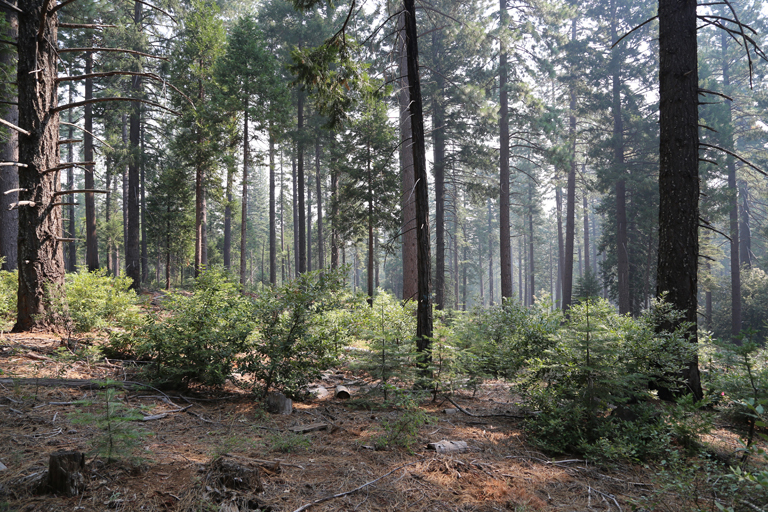 Or if plant species with deep-growing, fine roots come to dominate a particular landscape, that could also cause more carbon to be emitted, while more plants with coarse roots would lead to the opposite affect. 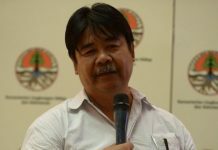 “We should be concerned because as temperatures warm, this deep soil organic carbon has the potential to be released as carbon dioxide forcing a positive feedback to climate change,” said Hicks Pries. Measuring soil depths at the study site. Photo Credit: J. Bryan Curtis.